People living with weakened immune systems, such as HIV-positive individuals and cancer patients receiving immunosuppressive therapy, are prone to opportunistic infections particularly oral candidiasis or thrush, a common condition caused by the fungal pathogen Candida albicans. Using antifungals to treat the condition often fails due to the increasing rise in drug resistance, and currently, there are no therapeutic strategies available to prevent the development of infection. 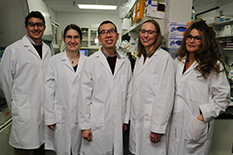 A team of University of Maryland researchers has addressed this dilemma by developing a new therapeutic agent for the prevention and treatment of oral candidiasis. The therapeutic agent uses natural, antimicrobial peptide derivatives with enhanced antifungal activity and stability. Unlike traditional antifungal drugs, the peptides adhere to specific receptors on the fungal cell wall and target the mitochondria, causing oxidative stress and cell death. To advance their invention toward clinical application, the investigators developed a hydrogel-based delivery system designed for topical application on oral tissue. The newly developed formulation was tested and shown to be effective in protecting against oral candidiasis in an animal model. The team’s findings were published in 2016 in Antimicrobial Agents and Chemotherapy. Currently, the investigators are developing additional models to explore the applicability of the formulation against various oral conditions. Specifically, in collaboration with Dr. Radi Masri, a prosthodontist at the School of Dentistry, they are evaluating the applicability of the formulation against denture stomatitis. Further, since the formulation has also exhibited tissue anti-inflammatory properties in addition to antimicrobial activity, the investigators have also developed a model to test the therapeutic potential of the formulation against periodontal disease, a common inflammatory disease that leads to tooth loss. “Oral candidiasis and periodontitis are recognized as serious public health challenges with high medical and socio-economic importance, and currently, there are no feasible therapeutic strategies to prevent and treat these conditions,” said Jabra-Rizk. As an affordable, over-the-counter therapeutic agent, the team’s invention has the potential to benefit a wide range of individuals predisposed to the various conditions. Given its successful demonstrated efficacy in animals, the team looks forward to the next step in the process toward developing the formulation for clinical application in humans. The invention was created by a team of researchers that includes Jabra-Rizk; Amy Karlsson, assistant professor in the Clark School’s Department of Chemical and Biomolecular Engineering; and Timothy F. Meiller, professor in the School of Dentistry at the University of Maryland, Baltimore. Support for the group’s research was provided by the UM Ventures Seed Grant Program and supplemented by funds from a National Institutes of Health (NIH) grant to Jabra-Rizk.